As a jeweller, I didn’t know when embarking in 2000 on a research fellowship that I was develoing arthritis in both my thumbs. 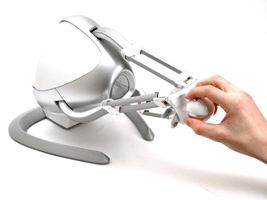 The research I did eventually led to the development of a haptic 3D modelling package (Anarkik3D Design). 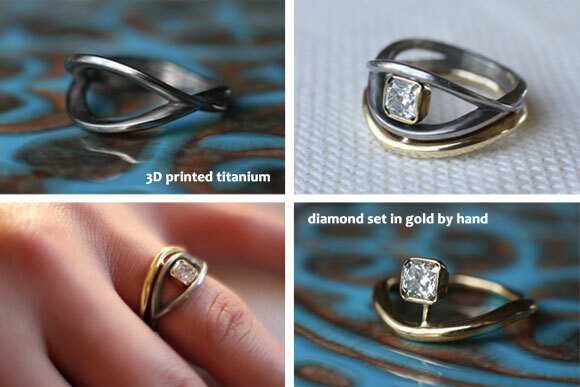 In a blog in 2012 I wrote that I used Anarkik3D Design and 3D printing to design and make my daughter’s wedding ring. I didn’t mention in the blog that I had to use 3D printing because it was too painful to hold a small ring securely as well as holding the tools to carve the titanium. I just said that this was now hard for me to remak at the bench. In these five years since, I have used Anarkik3D Design a lot, both testing each version that comes out and designing samples to 3D print out for classes and for corporate commissions. The haptic device we use has a spherical grasp with 4 buttons and I am really pleased that using it to design causes very little pain, even after a long session. Having my designs 3D printed means that much of the making that previously would have been done at the bench has been accomplished using this technology. 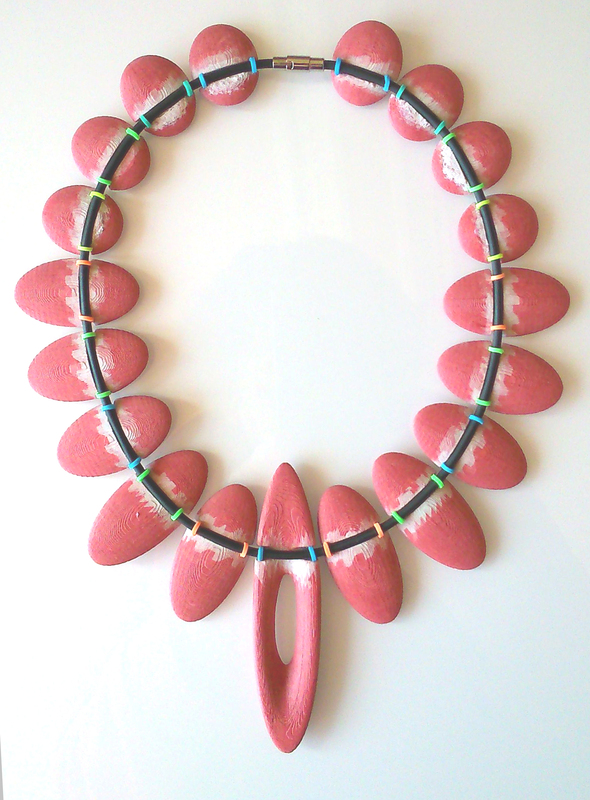 I can cope with light bench work such as finishing pieces, adding brooch pins and ear fittings, connecting units into a necklace etc.. 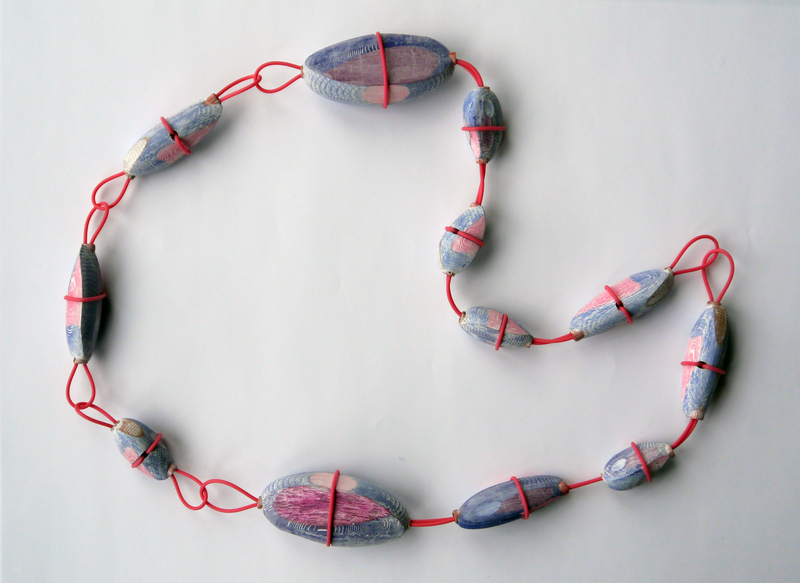 I designed this necklace a couple of years ago and had units made for 3 necklaces, one for myself and the other 2 for two women to celebrate the super work they do promoting 3D printing. Last year I made an exhibition piece, the first for a very long time. I was, with 20 or so others, invited by the Association for Contemporary Jewellery to send in a new piece of work for their 20:20 Vision Exhibition which opened in January and will tour for a year or so. I designed and prototyped various units, with the final ones printed in paper and strung onto Ninjaflex. And the process was almost pain free as it was very light work. The blog on the prototyping process is here. Now with an exhibition at Galerie VundV in Vienna planned for October/November 2017 I am really looking forward to getting back to designing and making a cohesive collection of pieces. This will be my first show of work where I have used our Anarkik3D Design package exclusively to do the designing for 3D printing! Exciting year in store! This entry was posted in Uncategorized and tagged 3D modelling, 3D printing, Anarkik3D Design, arthritis, designer makers, designing, Falcon, haptic, jewellery, makers, making, virtual touch by annmarieshillito. Bookmark the permalink.